Archaeologists call the first people to occupy Mesa Verde, “Paleoindians.” Approximately, 11,000 years ago, these first people survived by hunting wooly pachyderms, horses, and giant bison. Gradually, the climate became warmer and the glaciers receded. At the same time new grasslands developed and grazers like deer, elk, and sheep replaced the larger animals. Then, in 6000 BC, the Archaic period began. The Archaic people were primarily nomadic, and they went where the food was. Then as they discovered newer and newer sources of food their population grew. Before long, people would spend much of the year living under outcroppings where they would store and prepare food in what became semi-permanent locations. Primarily, at this time people were still hunters and gatherers. This period ended in 1000 BC with the introduction of domesticated corn, squash, and beans. This Archaic period was followed by the Basketmaker II period. This period is called Baskermaker because of the beautiful remnants of baskets that have been uncovered during archaeological digs. At this time, the Ancient Anasazi became farmers, while continuing to hunt and forage. However, they did not make ceramic pottery during this period. These people made feather blankets, sandals, rabbit-skin clothes, flutes, whistles, and jewelry to a high level of sophistication. The Basketmaker III period lasted from 650 AD to 850 AD. Only 1,000 to 1,500 people lived in Mesa Verde in 650 AD. These are the same people who archaeologists call Anasazi or Ancestral Pueblan. They are most certainly descendents of the present day New Mexico, and Arizona Pueblo people. These people lived in pueblos that consisted of pit house dwellings. The dwellings were nothing more than a shallow pit and wooden framework that was covered by brush and mud. The Anasazi depended almost entirely on corn agriculture. Many major advancements occurred at this time, including the development of stone tools, ceramic pots, metates, and bows and arrows. During this era pueblo sites included from 15 to 20 households. Sometime round 900 AD the population witnessed a rapid decline. Many people moved to areas near the San Juan River and to Chaco Canyon, which were now the center of the Anasazi or Ancestral Pueblan world. Then, in 1050 AD, the population again began to increase. At this time people were living in homes that were above the ground. Kiva construction was also popular. Kivas were used for both religious rituals as well as household activities. During the 1200's the people who inhabited Mesa Verde constructed more than 600 buildings in alcoves. These cliff dwellings were major residential villages that kept the inhabitants secure from the attacking enemy. The largest of these is Cliff Palace which contained 220 rooms and 23 kivas. 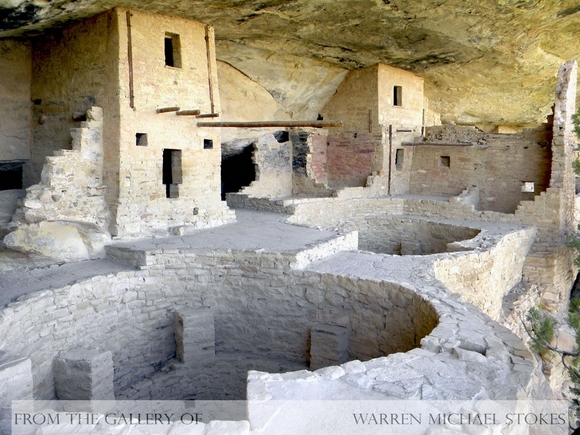 Long House is the second largest of the cliff dwellings with 150 rooms and 21 kivas. Over 200 people lived in Long House. At its peak, it is believed that over 3,000 people occupied the 33 cliff dwellings in what today is Mesa Verde National Park. By 1275 AD a severe drought again forced everyone to move to more hospitable areas. Eventually, these people evolved into a multitude of cultures including the Aztecs.